My sister passed away from cancer last spring. She had fought very hard to be here for the birth of her son's first child. Sadly she wasn't here for the birth of Jesse in August. My brother in law brought me some of her clothes in the summer. I am using what I can, but wanted to weave three Debbie memory rugs for him, and for my niece and nephew. I finished two of the rugs on Sunday, just on time to deliver them to my niece and nephew in the city. I got home yesterday to find this lovely photo in my inbox. Sweet baby Jesse sound asleep under the memory rug, getting a hug from his Grandma Debbie. 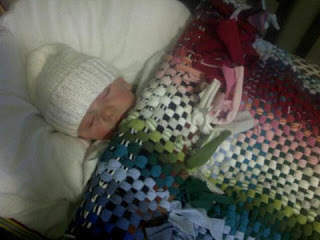 Oh Pegg, that is such a touching story.What a perfect idea to make memory rugs from Grandma's clothing.